ARMY PVT. 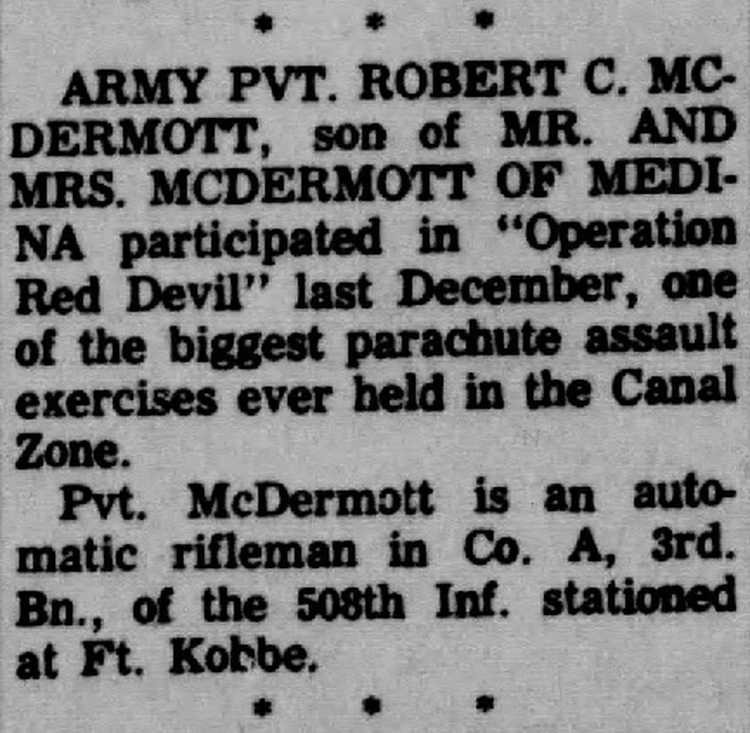 ROBERT C. MCDERMOTT, son of MR. AND MRS. MCDERMOTT OF MEDINA, participated in "Operation Red Devil" last December , one of the biggest parachute assault exercises ever held in the Canal Zone. Pvt. McDermott is an automatic rifleman in Co. A, 3rd Bn, of the 508th Inf., stationed at Ft. Kobbe. [Medina County Gazette, Medina, OH, Tue, Jan 17, 1967, Page 2] Army Pvt. Jon D. Cottle, 18, son of Mr. and Mrs. Jon W. Cottle of 3210 Winfield St.; Pfc. Grady L. Towns Jr., son of Mr. and Mrs. Grady L. Towns, Haines City; and Army Spec. 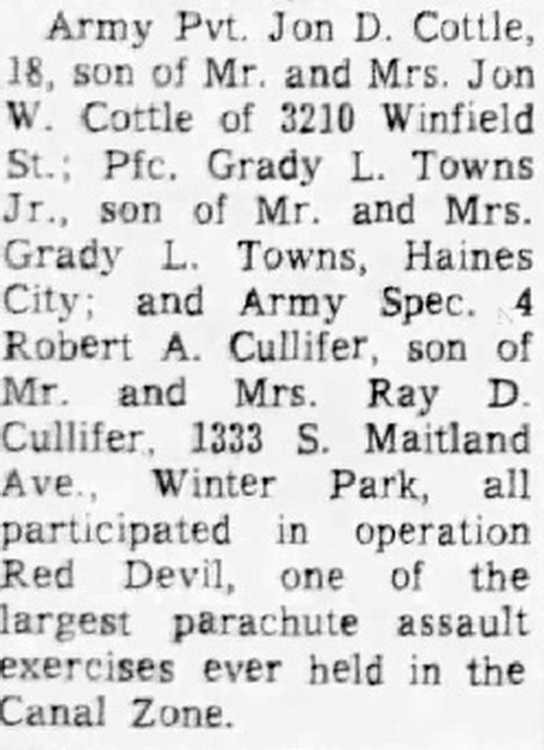 4 Robert A. Cullifer, son of Mr. and Mrs. Ray D. Cullifer, 1333 S. Maitland Ave., Winter Park, all participated in operation Red Devil, one of the largest parachute assault exercises ever held in the Canal Zone. Pfc. David J. Compton, 19, son of Mr. and Mrs. Edward G. Compton of 101 Richardson Drive, recently participated in "Operation Red Devil," a parachute assault in the Canal Zone. Pfc. JOSEPH RICHARDSON, 2117 Ashley Ave., Lakewood, participated last month in "Operation Red Devil," one of the biggest parachute assault exercises ever held in the Panama Canal Zone. As a member of Company B, 3rd Battalion of the 508th Infantry stationed at Ft. Kobbe, Canal Zone, he went through six weeks of training in Vietnam-style jungle fighting.